Subway outlaws is proud to bring you one of the all time Super Kings of the early Subway writing movement, COMET 1. He started bombing the now non existent third avenue El Subway line. Staff 161 gave him his first pilot marker and quickly he became king of the insides of the 2's and 5's for quite a few years. Just like every kid remembers his first toy, every writer remembers his first piece. His first piece was done on the old 3rdavenue El train parked in the 2 yard. More importantly COMET was part of one of the greatest partnerships in Graffiti history! Comet would meet legendry writer BLADE 1 while in school detention. The two would make a pact and join forces to make one of the greatest partnerships in Graffiti history. Taking over the 2 and 5 line inside and out. From 1974 to 1981 practically every subway car that pulled into a station on the 2 and 5's either had a Whole car top to bottom, panel piece, burner or throw up by each of them. Side by side BLADE & COMET covered New York City transit, branching out to other Subway lines and placing them on M.T.A's most wanted list. The transit police focused all their efforts to try to apprehend the two, but BLADE & COMET were always 3 steps ahead of them. The two had a mystic like BUTCH CASSIDY and THE SUNDANCE KID but to the writing community they were seen like the BABE RUTH & LOU GEHRIG of New York City Subways. COMET was the driving force of the team, he pushed his partner or partners to do more and more even once New York city transit began their big toxic buff in 1977. No one partnership was more successful then that of BLADE & COMET nor did any one writer do more on the Subways then BLADE and COMET did. COMET would also write with other greats such as SILVER TIPS, AJAX , CLIFF 159, SHAKE 1 and BILLY 167. In 1981 COMET moved his attention to the number 6 line and attempted to take away the line from SEEN and the UA boys. But this was never to be, due to an unfortunate incident he would be sent away for 5 years of his life. He would return to the Subways in 1986 to blast away the computation. Just when every one thought he was long gone, COMET opened the eyes of a new generation of writers. COMET kept painting for two more years then retired from active painting. 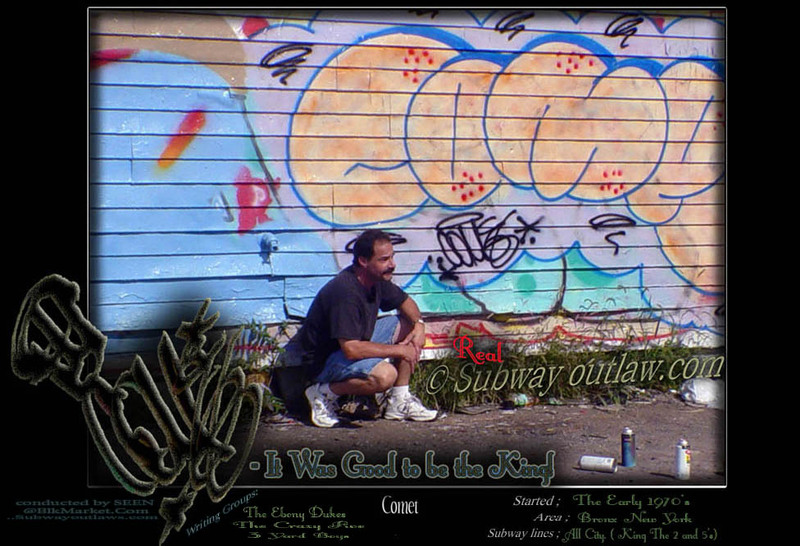 A true Subway Outlaw, COMET will shear a little bit of his history with us on what it took to be a legendry Subway Super king.